One of my favorite things about having a Droid is, rooted or not, how highly customizable the phone is; from the layout, to the font face and down to the type of smiley face used in a text message – almost everything on an Android phone can be manipulated with ease. You can go to the Google Play store and perform unique searches for each element you’d like to change. Or, if you’re feeling super efficient use an application like Zedge, a nice and breezy tool for personalizing your phone, which come with a lovely conglomeration of live wallpapers, ringtones, notifications and games. Unfortunately, having a highly customizable phone is a double edged sword. On one hand, there are so many nifty apps that you can essentially make your phone look like anything you’d like. On the other hand – because there are so many different applications and links downloaded to your phone, you increase the chance of downloading malware, spyware, and adware by roughly 1000% (don’t worry, I’m a statistics major). A few weeks I decided I wanted a new live wallpaper or two on my phone; instead of going straight to the Google Play store, I went through Zedge. I was stoked, too – I had one of those Matrix looking scrolling wallpapers and felt uber high tech. It wasn’t til about a week later that I noticed my phone behaving strangely. I would wake up with new applications downloaded to my home screen and wonder if I was “sleep downloading” or if there was a ghost in the machine. I’d scratch my head in confusion, but wouldn’t get anywhere. Truly bizarre! Then came the coup de grâce – instead of receiving normal notifications, I was getting banner ads; ads on my freaking phone. After a few deep breaths, a beer and some web browsing – I found the culprit: some of the applications I downloaded in hopes of beautifying my GUI were actually feeding me ‘push ads‘ and hindering it’s performance. One would think there would be a simpler way to ‘opt out‘ of receiving these ads, but it’s deceptively difficult. First, when the notifications pop-up there’s a hyperlink that comes with it – only the hyperlink is cutoff typically halfway through, making it harder than necessary to stay calm and carry on. 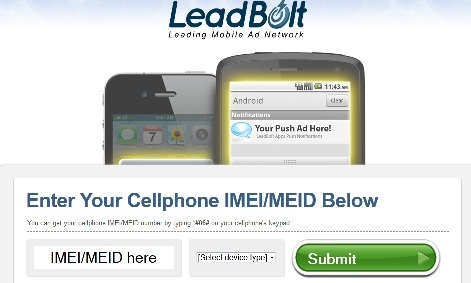 Secondly, if you’re lucky enough to actually pull it together – you could be asked to enter your IMEI / MEID number and (a) I don’t know what the hell this is, (b) I don’t know where I’d find it and finally (c) why would I give private phone information to a company that is spamming my phone with ads. Instead, I downloaded a few fabulous and highly recommended applications to keep my phone in pristine condition: AirPush Detector, Lookout Ad Detector, and TrustGo Ad Detector. It’s as simple as pressing ‘start scan and the Ad Detector goes to work; analyzing the applications on your phone for suspicious activity and kicking back the results in a clean, straightforward format. As it turns out, two of my new live wallpapers – Cheetah Print Live Wallpaper and Zebra Live Wallpaper, were responsalble for the banner ads I was receiving in my notification window while another, Brightest Flashlight Free, was downloading applications without my permission straight to my home screen. 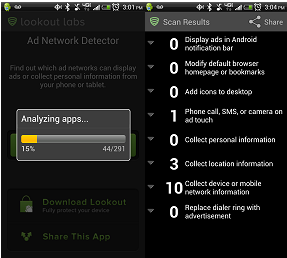 So far, I’ve used the Ad Detector from Lookout Labs – and with a few click throughs, you’re able to go straight to the offending application so you can hit ‘uninstall‘ immediately; amazing! Almost all applications that are amazing on the Droid you can purchase or download from the Google Play store; but here and there, you’ll find something that you think is so rad that you don’t mind it comes from a third party. 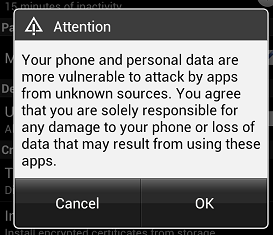 The problem is: you should because third party applications are some of the biggest culprits of mobile ads and spyware. So, to ensure you don’t accidentally download one of them – take this precautionary measure. In your Android menu, go to Settings > Security and you’ll notice you can toggle the menu for “Installation of non-Market apps”; if you ever choose to allow a third party application, you’ll get the following warning – just remember, it’s there for a reason!